Power their work and lives with purpose and meaning. Align all of their activities with that purpose. Connect with mutually helpful colleagues and intimates. Energize themselves to thrive in this interesting and engaging career. To help develop these essential skills, the book contains exercises that can help faculty hone their abilities to anchor their work, roles, and use of time in their most deeply held values; to integrate their personal and professional lives into a seamless whole; to experience more work-life balance; and, ultimately, to create a legacy of a life well-lived. Administrators will also find the book a useful tool for guiding their faculty to produce, stay engaged, and experience job satisfaction. A former professor of psychology and department chair at the Notre Dame of Maryland University, Susan Robison provides faculty development workshops and productivity coaching at higher education conferences and on college campuses. As faculty become accustomed to doing more with less, they must learn to work faster, more effectively, and with more measurable results. However, the top three stressors for faculty are factors over which the individual has a great deal of control and which are caused mainly by personal perceptions or lack of ability to set and carry out goals. 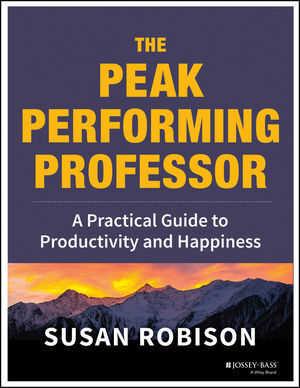 THE PEAK PERFORMING PROFESSOR: A Practical Guide to Productivity and Happiness (Jossey-Bass, a Wiley brand; October 2013; $40; Paper; ISBN: 978-1-118-10514-6) is grounded in research on neuroscience, faculty development, work productivity, positive psychology, and resilience. The techniques and strategies in this faculty development guide go beyond a discussion of work-life balance and teaching tips to offer practical tools for managing the life of the professor while maximizing his or her potential. Faculty members who complete THE PEAK PERFORMING PROFESSOR’s exercises will be able to anchor their work, roles, and use of time in their most deeply held values, to integrate their personal and professional lives into a seamless garment, and to create a legacy of a life well-lived. THE PEAK PERFORMING PROFESSOR is organized into four main skill sets that enhance peak performance: how to energize and motivate with purpose and meaning; how to align your resources such as activities, time, money, and energy with purpose and meaning; how to connect with mutually helpful colleagues and intimates; and how to flourish by broadening and building resilience for the long haul of an academic career. THE PEAK PERFORMING PROFESSOR also helps administrators who want their faculty to produce, stay engaged, and experience job satisfaction; who aim to decrease numbers of “problem people” who complain about stress spillover from home to work and vice versa; and who recognize that faculty with low engagement cost their institutions directly with lowered productivity and health care expenses for stress-related disorders and indirectly with rehiring costs entailed when faculty leave after failing to meet tenure requirements.